The Mint Dispensary, operator of one of the largest medicinal cannabis dispensaries in the United States, is launching the country’s first full-service cannabis kitchen in Guadalupe, Ariz. on Friday, Oct. 5. Patients seeking relief through medicinal cannabis can now access freshly-prepared, cannabis-infused meals created by a professional chef at the dispensary’s 12,000-square-foot Guadalupe location. 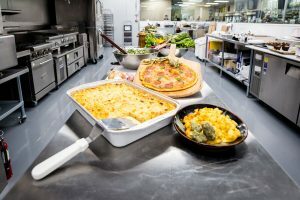 As part of the dispensary’s recent $2 million renovation, The Mint Dispensary’s state-of-the-art commercial kitchen will offer breakfast, lunch and dinner options in addition to snacks. While pre-packaged, shelf-stable food items have been available at dispensaries, this is the first time that patients will have access to fresh foods that are prepared on site with a customized dose of cannabis. “Our industry continues to evolve at an exponential pace,” said Eivan Shahara, CEO of The Mint Dispensary. We saw a large unmet need from patients who were regularly visiting our dispensary; they were looking to access fresh and healthy cannabis-infused foods. The new kitchen will offer a complete menu of artisan burgers, pastas, pizza, and other delicious cannabis-infused meals that patients can order to-go. The new kitchen will also have a barista, a juice bar, gelato, and a wide assortment of pastries. Chef Carylann Principal, a classically-trained chef and cancer survivor, created all of the recipes for the dispensary. She joined The Mint Dispensary’s team as executive chef to share her food and nutrition knowledge with other people who are facing similar battles. “It’s a place where art meets science. In addition to understanding the variety of flavors that different cannabis strains can add to any dish, we’re also carefully calculating customized cannabis doses. We’re not only delivering delicious and fresh foods, but we’re also meeting the often-complex nutritional needs of patients who are living with a wide range of illnesses. Available in customized doses ranging incrementally from 10 mg and up, the breakfast/snack menu includes Blueberry Muffins, Apple Fritters, Donut Holes, Raspberry Linzer Bars, Scones and Banana Bread, which are all available individually or in combination with coffee. For lunch and dinner, patients can choose from Artisan Burgers, Hatch Chile Macaroni & Cheese, Street Tacos, Fries and Pizza. A full menu will be available at The Mint Dispensary’s website when the kitchen officially opens. 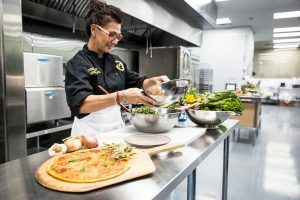 Chef Principal and her five-member team will prepare a steady stream of foods during the dispensary’s regular operating hours – from 8 a.m. to 10 p.m., seven days a week. This medicinal cannabis kitchen at Mint Dispensary represents the progress being made in patient care and in cannabis product development. Chefs like Chef Principal are leading the way.